This is the classic Everest trek. You will experience an unbeatable combination of natural beauty and cultural splendor. 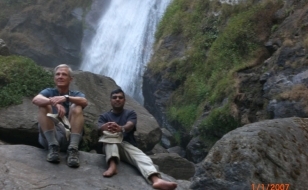 The immense contrasts in altitudes, type of vegetation and mix of lifestyles are the main highlight of this trek. One can enjoy beautiful mountains views, verdant terraces and Himalayan streams and waterfalls as the trail crosses through villages and landscapes covered by rhododendron, magnolia and giant forests. The mountains to be sighted during the trek are Gaurishanker, Number Himal, Kwangde, Twache, Nuptse, Lhotse, Amadablam, Thamsherku and Everest. The trek begins at Jiri (1905m). The trail heads eastward through the lovely forested hills of Solu and over the 3530m Lamajura Pass. Monasteries and uninterrupted mountain views lie ahead. The portion of the trek from Jiri to Lukla is often quiet, and therefore much better trekking country. We cross the Lamjura La, and Thaksindo before descending towards the raging river of the Dudh Kosi. We follow the “Dudh Koshi river” north through terraced hillsides and small villages to join the main Everest trail below Lukla. About nine-hours bus ride east of Kathmandu via The trip will begin with an about nine hour bus drive. We will head eastward from Kathmandu and drive along the Arniko highway. The road passes through Bhaktapur, Banepa, Dhulikhel, Dolalghat and Lamasanghu. From Lamasangu, we will divert towards Jiri leaving the Arniko highway. We pass through lush green forests enjoying the wonderful view of the snow capped mountains. After a drive for about 188 km, we will reach Jiri, a small town named after an ethnic community Jirel. Trek from Jiri (1905m.) to Deurali (2705m.) which takes about five and half hours. The beginning of your trek is gently ascent for the first two hours to Mali Danda (2440m.) and then it follows gently descent path to Shivalaya (1800m.) where you could take lunch and hang around. 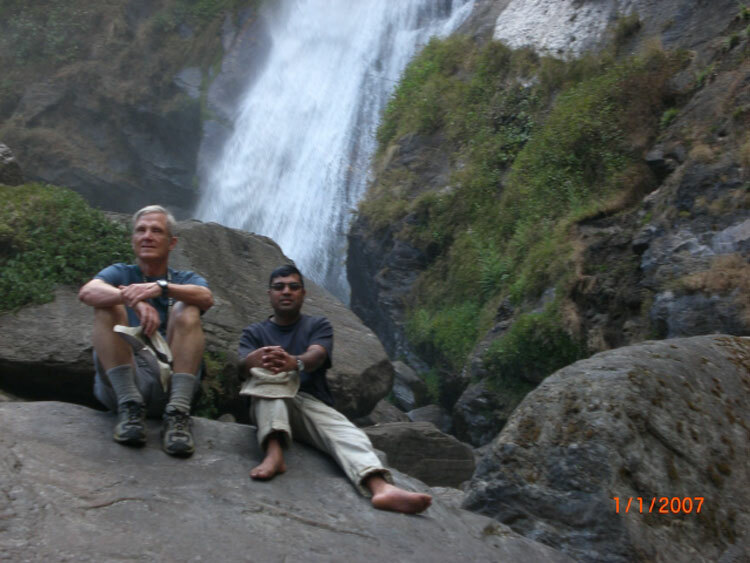 After your lunch, the trail steeply goes up for two hours and rest of the day is gently up to the Deurali. You could enjoy the green scenery as well as some of the snow capped mountains at a far distance. Trek from Deurali (2705m.) to Sete (2400m.) and it takes about six hours. The starting of your trek is steeply descent for early an hour to Bhandar (2250m.) and then gently descent to Kenja (1600m.) where you could enjoy your lunch. After your lunch, your trek is steeply up to destination. En route, you could enjoy with agricultural farm scenery where locals work hard. In addition to this, you could pass through Sherpa villages with beautiful mountain views. Trek from Sete (2400m.) to Junbesi (2675m.) and it takes about six hours. To begin your trek, you should climb steeply for an early two hours passing through Dagchu, Goyem, a small Sherpa settlements. Then your trek starts gently up to the Lamjura Pass (3500m.) through rhododendron forest. After the pass, rest of the trek is gently and steeply descent to the destination. In this route, you could enjoy some of the snow capped mountains such as the "Goa of the Solu". Besides this, you could see some wildlife such as monkey and many species of birds. Trek from Bupsa (2350m.) to Surkey (2400m.) which takes about five and half hours. At the beginning of the day, you should ascend steeply for the early two hours to Khari La Pass (2880m.) passing through rhododendron and oak forest including a small Sherpa settlements and tea shops. From this point, you could see excellent view of different mountains such as Numbu (6960m. ), Cho-oyu (8201m. ), Gyangchung Kang (7922m.) and Thamserku (6629m.). Now, your trail is gently descent and pretty flat to Chaubar (2730m.) passing through Bamboo forest and Puiyan (2770m.) 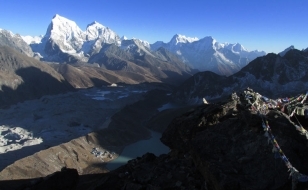 with view of Khumbu Valley as well as beautiful mountains. At the end of the day, your trail steeply descends up to the destination. Surkey is a small Sherpa village at the bottom of the Lukla. Trek from Surkey (2400m.) to Phakding (2652m.) which takes about five hours. The first part of the trek is gently ascent for early 2 hours to Chhiplung (2700m.) a junction road to Jiri and Lukla passing through Mushe (2650m.). From this place, the road is quite broad and busy. Now, your trail is almost flat and gently descent and ascent to Phakding. This is a short trek after 3 long days trek. You could hang in and around Phakding village. Trek from Phakding to Namche Bazaar (3440 m.) which takes about five hours. This day you trek and cross the river on high suspension bridges. Beyond Monjo(2800m.) is the entrance to the Sagarmatha National Park which was set-up in order to protect and preserve this fragile mountain environment. You then ascend quite steeply to Namche and along the way, if the weather is clear, catch a first glimpse of Mt Everest in the distance. You can also enjoy the view of Mt. Kusum Kangaru, Thamserku, Konde-Ri, Tawache peak. You can also visit some of the village monasteries on the way of trekking to Namche Bazaar(3440 m.). Namche is the main trading village in the Khumbu region and holds a busy Saturday market. There is set a meeting place for the Hindu traders from the lowlands and the Tibetan yak caravans that have reached there by crossing the glaciated Nangpa La. Rest at Namche Bazar for acclimatization and excursion around the places. Namche is tucked away between two ridges amidst the giant peaks of the Khumbu and has an abundance of lodges, tea shops and souvenir shops as well as a magnificent outlook. It is an ideal place to spend a rest day for acclimatization to the high altitude before heading off towards Tyangboche. For the acclimatization you walk upto Khunde Hospital which was set-up by Sir Edmund Hillary, or a one hour walk up to the Syangboche (3800m.) where Everest View Hotel is situated above Namche for the outstanding view of Everest, Nuptse, Lhotse, Ama Dablam, Thamserku and Kusum Kangaru. There are also good views from the National Park Centre and Museum just above the town. Trek from Namche Bazaar to Tyangboche (3850 m.) and it takes almost five hours. From Namche, the trail contours around the side of the valley, high above the Dudh Kosi. Now you have a glimpse of first really good views of the great peaks of the Khumbu including Mt Everest, Nuptse, Lhotse, Ama Dablam, Thamserku and Kusum Kangaru . Passing by several villages and numerous tea shops, the trail descends steeply to a bridge over the river Dudh Koshi at Phunki Tenga ( 3250m. ).The village has an excellent place for lunch and you can take a short rest before making the steep climb to Tyangboche. Although exhausting due to the zigzag path, the trek has numerous attractions like rhododendron bushes, beautiful birds chirping and superb mountain scenery making your trek exciting. Tyangboche is famous for its legendary monastery, the largest in the Khumbu region. Trek from Tyangboche to Dingboche( 4350m.) which takes about five and half hours. You gradually descend through a forest, cross the Imja Khola and climb steadily up to the village of Pangboche. This is directly opposite to Ama Dablam [6,856 m], and has exceptional views of the mountain, with the Gompa, mani walls and scattered pine trees in the foreground. As you gradually ascend , you do find thick forests but the trail is full of thorny and juniper bushes. A further two and half hours walk brings us to Dingboche. Here you can see Sherpa people working hard in the agricultural farm. Rest at Dingboche for acclimatization and excursion in and around the places. Here you can steeply climb up to Nakartsang Gompa for the rare outstanding view of Mount Makalu ( 8463m.) 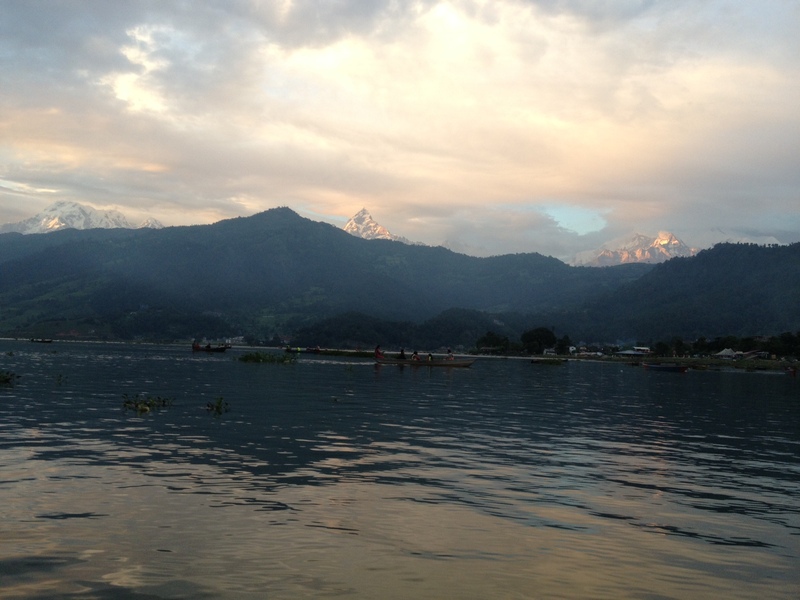 along with Lhotse, Island Peak, Baruntse, Ama Dablam and Thamserku. The another option provided is a small side trip to Chhukung which takes about 2 and half hours to go up and 1 and half hours to come back to Dingboche. There are some of the lodges which serve you the delicious food items. Trek from Dingboche(4350m.) to Chhukung (4730m.) and it takes about three hours. The trail gradually ascends up to the Chhukung. On the way, you can see summer huts made especially for keeping the lives tocks in summer time. Along this, you enjoy the beautiful mountain views in and around the valley. Trek from Chhukung to Chhukung Ri (5546m.) to Lobuche (4900m.) via Dongla(4620m.) and it takes almost six hours. From Chhukung Ri you can have a view of Mt. Nuptse (7896m. ), Mt.Lhotse (8511m. ), Baruntse peak (6800m. 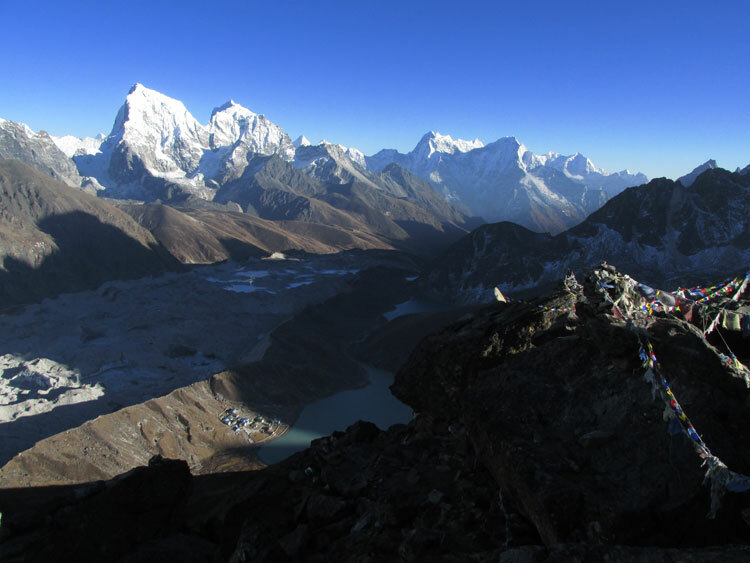 ),Ama Dablam peak(6856m. ),Thamserku peak (6608m. ), Konde Ri or peak(6187m. ), Tawoche peak(6542m. ), Cholotse peak (6441m.) and more. Now you begin your trek to Lobuche via Dongla which offers you panoramic view of the mountains along the way. The teahouse at Dongla is a good spot to have lunch, before zigzagging up through the boulders of the glacier's terminal moraine. At the top of this climb there are many stone cairns, built as memorials to the many Sherpas who have died while climbing Mt Everest. The path then climbs gently along the glacier, to eventually reach the cluster of houses at Lobuche. Trek from Lobuche (4900m.) to Everest Base Camp via Gorakshep (5180m.) and back to Gorakshep which take about six hours. You will have lunch at Gorakshep, take rest and if the trekker feels fine, the participants can walk to Everest Base Camp (5486m.). 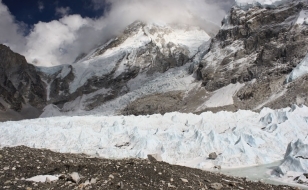 You will spend about 4 and half hours trek up to Everest Base Camp and back to Gorakshep. The trek is on glacier and snow capped rocks. 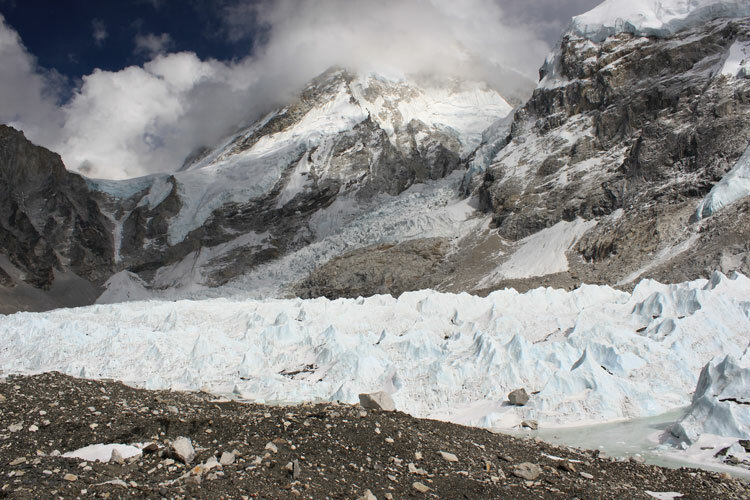 You can also see many small frozen lakes around the Everest Base Camp and return back to Gorakshep. Trek from Gorakshep to Kala Patthar (5545m.) and back to Pheriche (4250m.) and it takes about six hours. Early morning climb to Kala Patthar (5545m.) and enjoy the view of sunrise. From Kala Patthar you can have a panoramic view of Mt. Everest and many other mountain peaks like Mt. Pumori, Mt. Lingtren, Mt. Khumbetse, Mt. Nuptse, Mt. Lhotse, Mt. Ama Dablam, Mt. Thamserku and many more. Pheriche is the place where one can make phone calls to any part of the world. You can see the mountain Yaks in Pheriche. Yaks are normally regarded as the porters in this area. The town of Pheriche is known as windy town. There you can see the perpendicular walls of Cholatse and Tawache. There is located Himalayan Rescue Association Aid Post and foreign volunteer doctors are to provide medical treatment to trekkers as well as local people. Trek from Pheriche to Phortse (3750m.) and it takes almost five hours. The trail descends to Pangboche and now the trail starts turning up and down in every half an hour to Phortse.. On the way there is an opportunity to see wild life in and around the area like mountain goat, musk deer and many species of Himalayan birds. There are village monasteries in Pangboche and Phortse rich in cultural heritage of Sherpa people. Along this, you see an old monastery in Pangboche which is believed to have been established during 16 century. The Pangboche village is known to have highest permanent settlement throughout the year. Trek from Phortse (3750m.) to Khumjung (3790m.) which takes almost five hours. The trail here descends for early twenty minutes and ascends up steeply for almost one hour to Mongla (4000m.). 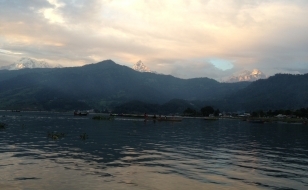 From this spot, you can see the panoramic view of Ama Dablam, Thamserku, Kusum Kangaru, Konde-Ri and Tawache peak. Now the trail descends and ascends frequently upto Khumjung. The Khumjung village is said to have the largest settlement of Khumbu region. There is well-equipped high school built by Edmund Hillary in 1960. Not limited to this, there is an old monastery where the skull of Yeti is believed to have preserved. The neighboring village of Khumjung is Khunde where a well equipped Hospital is built by Edmund Hillary in 1964. Trek from Khumjung to Thame (3800m.) and it takes about five hours. Thame is a place where you can visit many ancient monasteries. You will be able to experience the real Sherpa culture and at the most, from Thame you can take a glance at the beautiful mountain peaks. Trek from Thame to Monjo (2835m.) which takes about five and half hours. While trekking from Thame to Monjo you come across few Sherpa settlements and you will meet friendly Sherpa people. Trekking this day is little bit easier in comparison to other days. Monjo is a small village and the area is mainly for agriculture. You can see people being engaged in agricultural activities. Trek from Monjo to Lukla (2800m.) and it takes about four hours. This day the trail gradually descends and ascends as well. You cross the Dudh Koshi river over suspension bridges. You take an early morning flight back to Kathmandu from Lukla which takes 35 minutes.